Pollen Burst Tabs (formerly ProJoba Polbax) contains natural organic hypoallergenic nutrient extracts from pure flower pollen. 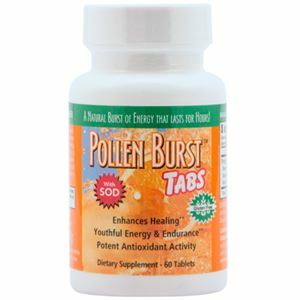 Pollen Burst Tabs promote natural energy (SOD) and endurance without caffeine. Recognized as a potent antioxidant Pollen Burst Tabs promote greater health enhance athletic performance and provide nutritional support required by the body to help deal with stress. SUGGESTED USE: Take one tablet twice daily. CAUTION: For adults only. If you are pregnant nursing or taking any medications consult your healthcare professional before using this product. Store at room temperature and avoid excess heat above 104F(40C). Ingredients: Proprietary Blend: [Flower Pollen Extracts, Botanical, Superoxide Dismutase (SOD)], Amount by Input: Pollen Extract, Std. 68 mg, Cellulose, Dicalcium Phosphate (Anhydrous), Stearic Acid, Magnesium Stearate, Silicon Dioxide and Croscermellose Sodium. Looks like you have entered a product ID (159) that doesn't exist in the product database. Please check your product ID value again!